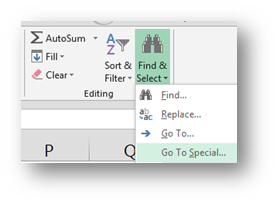 Here’s a nifty little trick I use every day while working in Excel. It’s a two part trick. Part one will be selecting all the blank cells in a range or rather reducing a selection or a range to blank cells within that range. Part two will be how to enter a value or a formula(!) 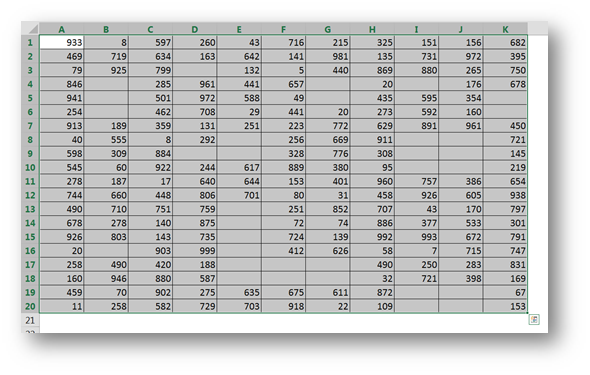 into multiple cells in Excel simultaneously. Ok so let’s get to it. Our final goal is to put a value into all blank cells, but to do this we must first select only those cells. This can be easily accomplished by selecting an entire range of data by using a Ctrl+A shortcut in Excel. The Home/Find & Select/Go ToSpecial… will take you to the desired command directly. 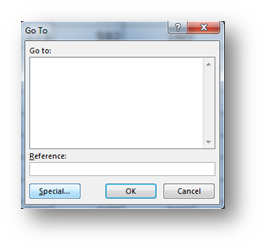 Now this is one of the best commands in Excel. In our case we will use the Blanks option. But take a look at some other options available in this window and let your imagination go wild! There is only one trick here and that is the following key combination Ctrl+Enter. So without clicking (!!! If you click anywhere the whole selection is lost and you are back to square one), you type a value you would like to put in all of the selected cells and press Ctrl+Enter. And that value now resides in all selected cells. Gasper, that is cool! & quick! Much better than Ctrl + click a cell… Thanks! 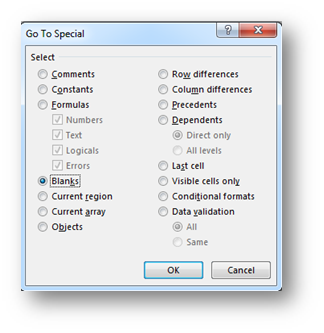 If you want to excel database to fill the blank cell next vrujednostima above, after the step where empty cells are selected, type the equal sign (“=”) and press CTRL + ENTER. This I read about fifteen years ago in a book and I believe that is one of the best practices that I have learned. not sure I understand you correctly. seems to me that all this method would give is an equal sign (=) in a cell. Could be I’m misunderstanding your comment. Brilliant tip – really useful. Just one niggle … I also want to unlock cells where a formula returns an empty cell … is that possible? 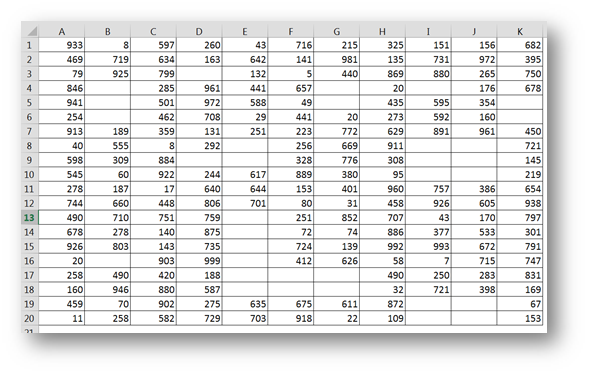 How would I select the blank cells in just one column as oppose to the entire sheet? And how would I be able to select blank cells up to the point that fall under an above cell with a value but not go to other blank cells that fall in the same column but under another value e.g. There were two sets of blank cells – those under Fred and those under Jane. Is there a way to fill the first set of blank cells with one set of information (Fred as in this example) and fill the second set of blank cells with another set of info. insted of fill all blank cells with the same info.? 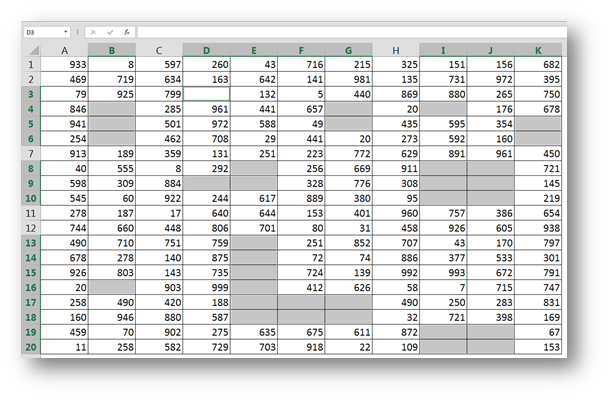 But you could try with Power Query and the Power Query Fill/Down command which is different than the Excel one. The easiest way is to insert a blank column after the names column. Assuming ‘Fred’ is in A1, then in B1, put =A1, and in B2 put =IF(A2=””,B1,A2) and copy that all the way down. You can then Copy and Paste Values in column B, and delete column A, if you want to tidy it up afterwards. Thanks Stevie… So that is another formula solution, but I would still opt for a Power Query one.